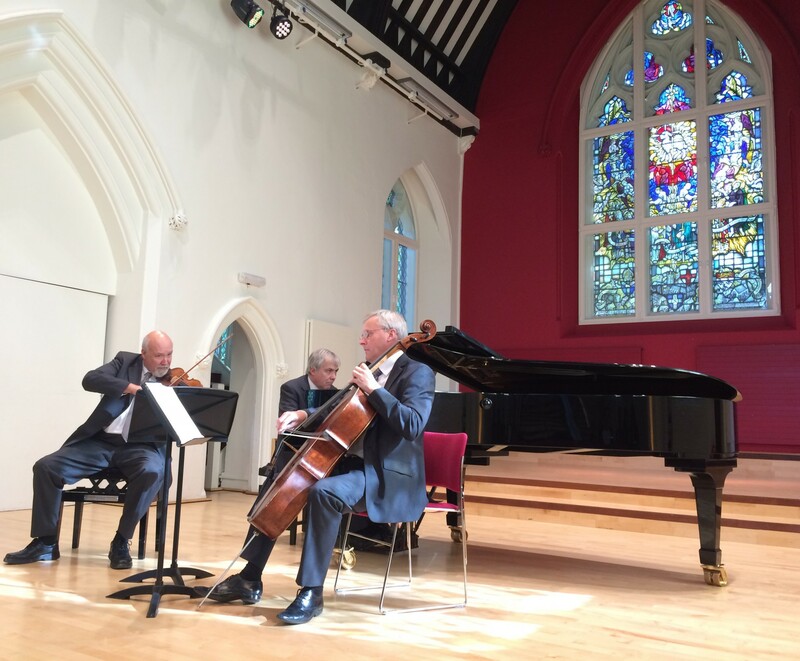 On Wednesday 12th October 2016, students, staff members and public alike were treated to just short of an hour of beautiful music by Haydn and Schumann, courtesy of the Primavera Chamber Ensemble of cellist Andrew Fuller, violinist Paul Manley and pianist Michael Dussek. The group is named after the Italian word for spring, and it is a name certainly appropriate, as these musicians embody that youthful, exuberant vivacity in their performance, which the season reflects. Primavera began with Joseph Haydn’s Piano Trio in C Major; a composer instrumental in the development of chamber music. Effortless, charming and joyful in its first movement with sparkling piano runs. Momentum is gained in the second movement, becoming thoughtful, dramatic and enthralling, particularly through the cello. The third evolves so precise and determined, swift and driven, where the violin comes to prominence. A consummate and confident portrayal of Haydn’s animated work, the exchanges between the three musicians so polished yet natural and at ease. A short pause ensued, the audience provided with a short interlude of marvellous description by Paul Manley concerning that which they had just performed and that which was to come. It was so evident in their speech that the musicians have a deep love and affinity for the classical work they perform. Robert Schumann’s Piano Trio Number 1 in D Minor began thereafter, into the world of the romantic composer so entrenched in storytelling. The first movement began sombre, almost melancholic, sections of which Paul described as if “underwater”, an entirely different “sound world”, as if the unseen protagonist of Schumann’s music were swimming to the surface, before sinking again, with an eerie repetition of the string phrases throughout. In the second movement, as if the surface of the water were broken, we continued somehow lively and energetic, but this phase is nothing when compared to the final thrust. The third movement begins slowly with a sense of lingering menace, despairing, which Paul tells us could be symbiotic with the psychotic tendencies the composer experienced in later life. However, it soon picks up the pace, rushing forward like a whirlwind. A battle ensues before a triumphant conclusion, as if banishing the darkness, but for how long? As the concert ended to a rousing round of applause in admiration of the performance, a couple of members of the group were kind enough to briefly speak with me and answer a few questions. Gentleman, thank you so much for that performance, it was absolutely outstanding. How did you enjoy playing in a space such as St Gregory’s? Andrew – It’s an intimate, beautiful space, perfect for chamber music. Paul – It’s magnificent, really well converted and built, with a lovely acoustic. Everything has been well thought out, down to the audience seating and the lighting. You are showcasing your work to a new generation of musicians in our students. Is that important to you? And what do you hope they will gain from your performance? Andrew – I hope it will encourage the students to go home and practice their instruments even more, and to go to more concerts like ours until they receive that infectious love of classical music. Paul – It’s imperative to pass on knowledge such as this. We need our next generation to get that enthusiasm for music, right into their blood, and develop a love for the art form. What advice would you give our students considering a career in this field? Andrew – Practice, practice, practice! They should make no mistake that it is difficult to make a career in music, you must not go into it with any illusions. However, if it is something you love the way we do, work hard and eventually that hard work will pay off. Paul – They need to look at all the facets that surround a career in music, not just the music itself as tempting as that may be. They will need to work on their management skills, learn to promote themselves well and learn how to be professional in this industry. Keep learning. Was it always your passion to become a professional musician and how difficult and/or rewarding has that journey been? Andrew – Yes, it was always what I wanted. It is difficult and it can be a long slog to make it as a musician, but it’s worth it. I love every day of my work. Paul – Yes, it was my dream. I love music, truly. Of course it has its ups and downs, but I am very lucky to know and work with amazing musicians. This profession gives you the opportunity to know another person in great depth through music. You share so much together and that in itself is extremely rewarding. What would you say is your proudest musical achievement to date? Andrew – Always the next one! Paul – It’s hard to choose. 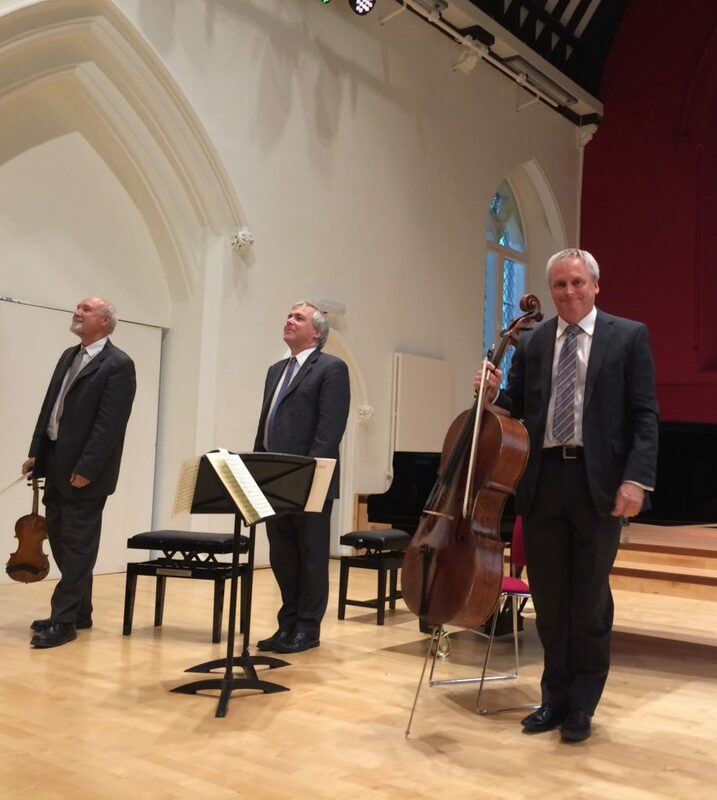 I think playing at Wigmore Hall – the prime chamber music venue in London and arguably in Europe – is definitely up there, alongside some of the brilliant tours we have taken abroad. I’d like to thank Paul and Andrew for speaking with me with such attentiveness and cheerfulness – they are lovely people as well as fantastic musicians – and an additional thank you to Michael who graciously apologised for missing our short interview as he had to rush off immediately after the performance. It was absolutely fascinating to watch these highly professional musicians at work and a delight to exchange a few words about their experiences and their love of the art thereafter. 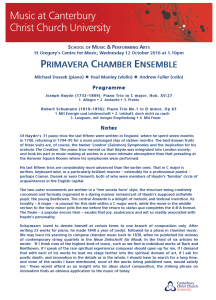 You can discover more information about Primavera Chamber Ensemble, including dates of their upcoming concerts, by visiting their website here. I sincerely hope this will not be the last we see of them in St Gregory’s Centre for Music. 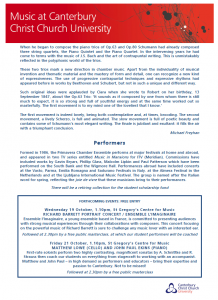 Our next lunch time concert is at the same time, in the same place next week. We are ready to welcome young, French musicians, Ensemble L’Imaginaire!